As a granola lover, I think that granola made with spices, some nice syrup, and all kinds of goodies is one of the greatest gifts to give, especially during this festive time when opening the jar is like Christmas – it just smells amazing with ginger and cinnamon. For a bigger gift, add a bottle of syrup with it or even a set of bowls to serve the granola in. Heat oven to 150°. Prepare a baking sheet and a baking pan. Place everything, except cranberries and cacao beans, into a bowl and mix well, so that everything is coated and moist. Tip the granola onto the pan and spread evenly. Bake for 45 minutes, mixing every 15 minutes so that the sides do not brown too much. Turn off the oven, leave the door ajar and leave to cool. When cool, add cacao and cranberries and mix. 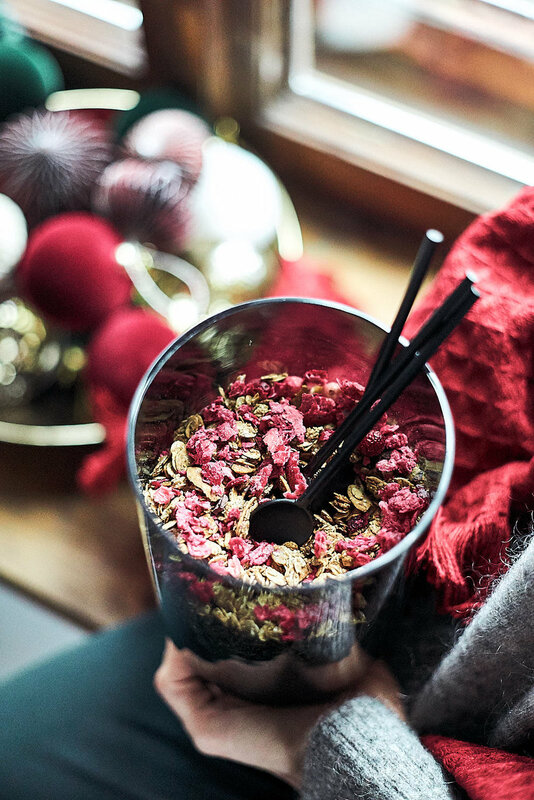 To make it as a gift, place half of the granola in a jar. Then add half of the cranberries, then granola, then cacao and top with cranberries. * Crush with your hands or pestle and mortar until small, but not powdery.